Sergeant William McGilvray, London Scottish Regiment. The Reverend Clive Atkinson of St Peter’s Church opened proceedings, acknowledging that a memorial plaque in St Peter’s Church, Chateau d’Oex was the inspiration for this event. As 100 years ago, the speakers at this bilingual commemoration event spread over two days included their Excellencies M. Charles-Andre Ramseier, Mayor (Syndic) of Chateau d’Oex and Mr. David Moran, the British Ambassador to Switzerland. Descendants of internees were present as well as local and foreign current residents of the region. All the Regiments whose soldiers arrived at Chateau d’Oex in 1916 were represented by Lieut Colonel T. Evans. A letter of thanks to the Swiss village was read on behalf of the fifteen British regiments present this day in 1916; as was a poem ‘Now and Then’, penned in 2016 by descendant Paddy Jackson. Would you kindly convey our gratitude to the people of Chateau d’Oex and the neighbouring villages and to the Swiss nation, for the hospitality and care bestowed on our 4000 British internees. These soldiers received a warm welcome in Switzerland from 1916 up until the armistice in 1918. 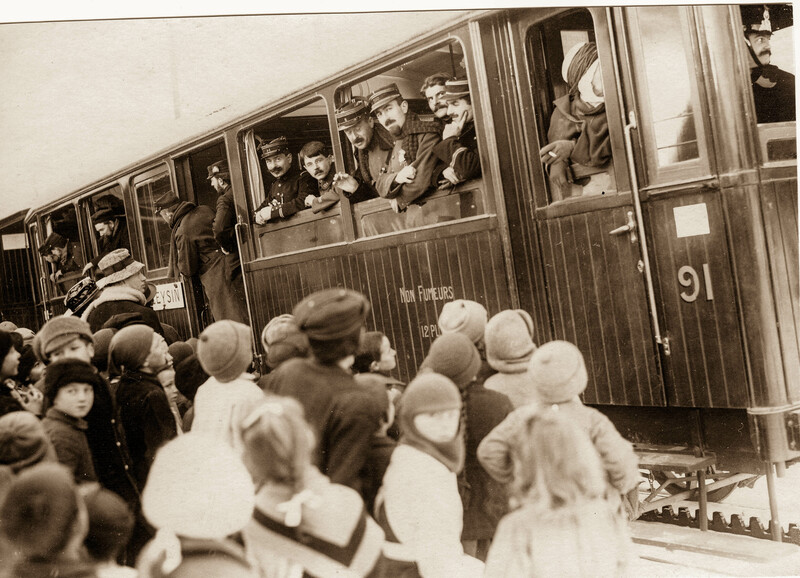 Exactly 100 years ago, 32 officers and some 500 soldiers arrived on the first train from Germany, on the 30th May 1916. Monsieur, le Syndic, as Mayor of Chateau d’Oex I would ask you to accept this bouquet of flowers, as an expression of affection for all those who contributed to their healing and their peace, and who also enabled them to rebuild their shattered lives in this quite magnificent place. Read by Susie Kershaw, granddaughter of Captain Cyril Edward Jolliffe M.C. of the Cheshire Regiment, in commemoration of the centenary of the arrival of the first British internees in Switzerland in 1916. Together gathered, ‘Now’ and ‘Then’. Routes entwined they led the way. Cross the border, silent order, ‘free’. The first of many, ‘Thirty Two’. Lives cut short, too young to die. They rest their heads in ‘Paradise’.